The vegan sausage roll has been causing quite a stir recently, but we felt it was high time it had a gluten-free makeover! 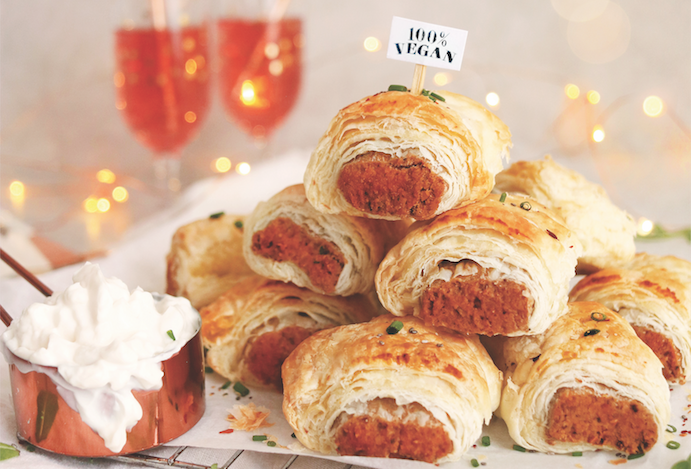 Here’s how to make the perfect gluten-free vegan sausage rolls according to Holly Jade from The Little Blog of Vegan. 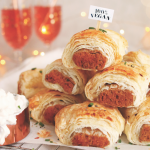 These vegan sausage rolls by Holly Jade make the perfect party food for a free-from crowd and will be a hit with adults and little ones alike. Preheat the oven to 180oC/Gas Mark 4 and line a baking tray with greaseproof paper. Place the chickpeas, ground flaxseed, walnuts, oats, soy sauce, garlic cloves, oil, paprika, herbs, coriander, black pepper and salt into a food processor/blender and whizz up until a sausage-like texture. This will take around 3-5 minutes. Unroll the puff pastry and cut it in half. With clean hands, grab some of the sausage mixture, roll it into logs and place onto one side of the pastry sheet. Brush some dairy-free milk on the edges of the pastry sheet and fold the pastry over the sausage. Using a fork, press the pastry layers together to create a seal. Cut into servings and place onto the lined baking tray. Brush some over the top of the pastries, then bake in the oven for 15-20 minutes, or until golden in colour. Serve hot with a dipping sauce or brush over some dairy-free butter. Best enjoyed hot and fresh on the day of making.